Last week I dusted off my tea room cookbooks for a special delivery. I'd love to run in Bread & Company, but not when I can make a whole recipe for the cost of 1 take-out meal. Someone asked where to find these to-go boxes. I visit the Kroger salad bar for an ingredient (chopped celery, a handful of grapes), then reuse the container for lunch. If anyone knows of a retail source, please let us know! Wow! That looks incredible! 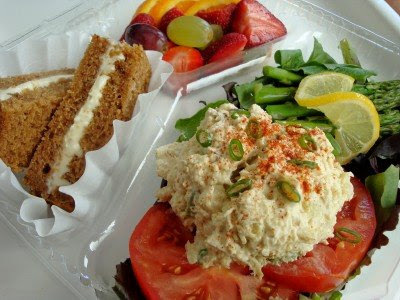 Is that chicken salad on top of the tomato? Do you mind sharing your recipe? I'm looking for a good chicken salad. I had a delicious one at Whole Foods Market's high tea demonstration yesterday, but it was the store's version that they sell, and I'm too cheap to buy it ready-made. Oh, that lunch looks soooo good! I love to collect cookbooks - can you recommend some of your favorite Tea Room cookbooks? Meredith-- you are the QUEEN! Thanks for the tip Roxie! Look to see if you have a local restaurant supply store- sometimes their prices beat Sam's and Costco and sometimes they don't! I find some really interesting things in restaurant supply stores! Meredith, you should be a caterer. You're always putting out these fabulous spreads that are so beautiful. My local Kroger will sell deli/bakery containers (disposable platters, cake boxes, etc.) for a minimal price. Simply ask. A lot of delis will sell you them by the piece for a low cost. I know I've bought cake containers to hold my cakes from them. I'm sure they would sell these. My Sam's Club doesn't sell the clear plastic shells, but I will check the restaurant supply store across town. I don't know if you have a store called "Smart and Final" near you, but they sell those kinds of items in bulk for a pretty good price. If you have a Cash and Carry or a URM, or any restaurant supply store nearby, you should be able to purchase. Most of them are open to the public also, and they often allow you to buy a sleeve or a case. I don't have a Costco membership and we don't have a Sam's Club, so for anyone like me, there are still options. That food looks wonderful! Now I'm hungry and it's only 9:20 a.m. It is funny how different Sam's clubs sells different things. The Sam's club here does sell the clear clam shell containers. They also sell the white foam ones too. (I agree the clear ones look better for presentation. Our Sam's club sell a container that is black on the bottom and clear on the top. It is an oval shape and does not have dividers. Here in LA we can get a similar container at Smart & Final. Smart and Final is a warehouse type store, but much smaller than Costco. There is no membership. The mostly cater to restaurants, but anyone can shop there. My Sam's Club carries those containers. Looks delish! Somebody's gonna be happy. Your Sam's Club probably DOES sell these containers, plus a lot of other ones, but you will have to go online and order them to be delivered to your local store and then pick them up 7-14 days later. And as far as I know you don't have to order a ton of them. You can just order as many packages as you want. Sam's sells a TON of stuff that they don't necessarily have in their store. Sam's Clubs sometimes have catalogs available that you can grab to look at, or you can see everything online. They might have some containers that would even give you more presentation options than these! And, as usual, your presentation and food looks lovely!! what is the little sandwich? my guess: cream cheese in datenut bread? Meredith, I am always so inspired by your hospitality and graciousness. You make the world a better place every day! My mom used to make my lunch look something like that, every single time she made it for me. My mind still boggles figuring out how she did it. I got in trouble if I didn't return the container though. I've occasionally seen containers like that at Smart and Final or Costco. had a pack of 10 --- just saw them! The restaurant supply place also has them - At times, I'm on special watch with lots of small restaurant businesses going out of business (sadly enough) - but will sell their supplies/cups/plates to go, other items for a fraction of what they're worth - check out the newspaper/craigslist for the 'going out of biz' sales on luncheonettes/etc. I read you blog everyday. It is one of my favorites:>) I don't know if you have a Save-a-Lot store where you live but they have had the plastic containers. I have bought them when I prepare a meal for people. You should check there. When I was growing up, my mom worked at a drug store soda fountain. This is the kind of food she often made and it looked just like this. It also reminds me of the tea rooms in two of our "nice" department stores. L. S. Ayres was famous for their tea rooms and the other was locally known. This was also the kind of "ladies lunch" they served there. Both tea rooms were still open when my daughter was a baby but closed soon after when more and more women went into the workforce. As if on cue, my Kroger decided to close its salad bar. thanks for the recommendations--looks like I'm going to need them soon!